This fill-in-the-blank, circle-the-answer Workbook (yellow) makes it fun and easy for kids age 6-12 to discover in God’s Word (the Bible) what obeying really means. Abraham takes the trip of a lifetime. Noah builds a boat big enough for a zoo. Each lesson in the 8-week study contains 5 days’ activities. 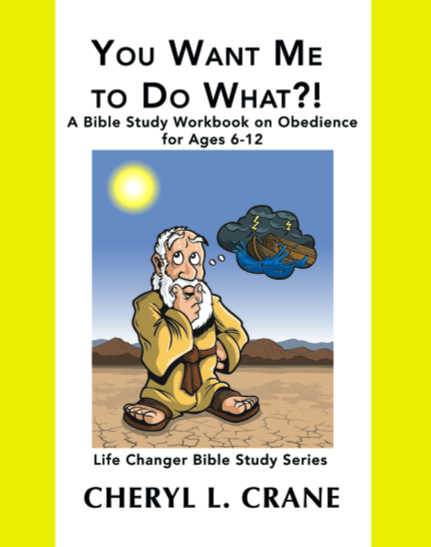 Through personal study and group discussion, kids not only learn what obedience looked like in Bible times, but also think through what obeying God means for them now. Verses are printed in the book so kids don’t have to know their way around a Bible to hear personally from God. Great for beginners or familiar Bible students. Families, homeschoolers, church and home groups all enjoy this unique multi-age study. Click here for Workbook Sample Lesson and Lesson Content & Principles. You don’t have to be a Bible scholar to lead children through this study! Most answers are easily found right in the week’s verses and are also printed in your Answer Key. The open-ended questions without printed answers make students think about what they’re learning and how it applies to them, personally. These draw from individual experience so you’ll hear varied answers. In family settings, or other study groups with mixed ages, older children may enjoy leading discussions. Invite children to open or close in prayer, or to be the first to share an answer on a question, to build confidence. Click here on How to Use Answer Key for details on getting started. Click here to get a Answer Key Sample Lesson. Facing Lions, Giants & Other Big Dudes is a fun 8-week fill-in-the-blank, circle-the-answer workbook. 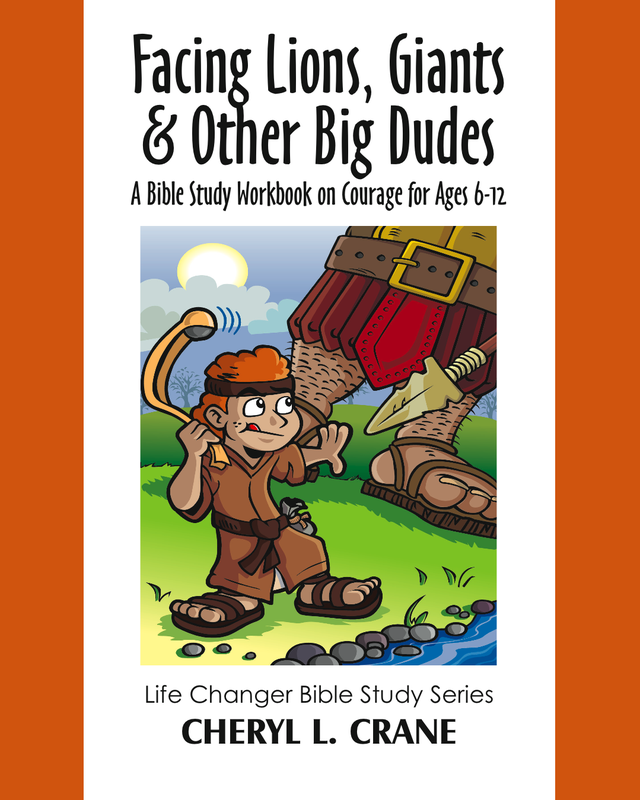 It captivates kids with exciting Bible adventures and walks them through kid-focused application questions to discover how they personally can live with courage. David reveals how to face personal giants. Joshua shows kids how to deal with daunting walls. Jehoshaphat teaches what to do when youâ€™re outnumbered. And with Peter, kids learn how to say the right things despite opposition. Facing Lions, Giants & Other Big Dudes will help your students become Courage Superstars! Verses are printed in the book so kids donâ€™t have to know their way around a Bible to hear personally from God. Anyone who purchases this book will have access to a FREE Answer & Discussion Guide PDF download. 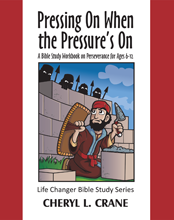 In Pressing On When the Pressure’s On, kids learn the secrets of stick-to-it-ive-ness from the Bible’s perseverance pros. Elijah was outnumbered 450 to one. Nehemiah had bad guys breathing down his neck. And a blind man whom Jesus healed was questioned by powerful politicians who were determined to change his mind. Yet these Bible heroes all proved themselves strong to press on in the work God gave them. This fun fill-in-the-blank, crack-the-code 8-week workbook will help your kids develop what it takes to keep going when the going gets tough. As always, verses are printed in the book so kids don’t have to know their way around the Bible to hear God personally. Boys and girls alike love the Bible adventures! Great for families, small groups, homeschoolers and more.